Arliss Sturgulewski, who will be naming her cabin for her daughter-in-law, Carol. Jeannie Penney, who will be naming her cabin for her mother, Betty Rice. Cathy Rasmuson, who will be naming her cabin for Halibut Cove artist Diana Tillion. Each cabin will have a photograph and biography of the woman whose name it bears. Dana Stabenow says, “Cathy Rasmuson is threatening to decorate her cabin with art by its namesake so we’re expecting competition among writers for Diana Cabin to be fierce.” We are so proud to have the support of these amazing donors, exemplars of how large-hearted and visionary Alaskan women can be. There are an additional three cabins still available for sponsorship as well as other opportunities to honor an important woman in your life. In equally exciting news, on November 14 we started a fundraiser to build the main house of Storyknife and dedicate it to Eva Saulitis. That fundraiser will continue until February 14, 2017, and during that time each dollar donated will be matched 2-for-1 by Peggy Shumaker and Joe Usibelli. Right now, $18,510 has been donated in Eva’s name. Our matching donors will turn that into $55,530. That’s right, in one month, we’re a fifth of the way there. To all of you who have donated thus far, thank you for your vision and your generosity. Remember we only have until February 14th to meet Joe and Peggy’s most generous matching grant, so we need to reach out to everyone who knew Eva and wants memorialize her giving spirit. Please consider donating either through the Generosity site or by check (Storyknife, PO Box 75, Homer, Alaska, 99603). Finally, we have just opened the application period for the four Storyknife Writers Retreat residencies available in 2017. From now until January 27, we are taking submissions. I know that people are excited, because in fewer than twelve hours, we already have two submitted applications. And considering that most of those twelve hours started at midnight on December 15, that’s pretty amazing! Here at Storyknife, we believe that women’s stories matter. The opportunity to devote her unbroken time and attention will not only enrich the writer, but add to the wisdom of the whole world. Rise up, women writers and write the stories and poetry that are inside you! In 2016 Storyknife hosted its inaugural Fellow, Kim Steutermann Rogers, for the month of September. Kim arrived on September 1st and departed on September 30th. While she was here she wrote 249 pages, which was better than I did that month. She integrated so fully into the Homer community that total strangers came up to me in Safeway to ask, “How’s the writer doing?” She wrote that on her first day in Frederica I told her, “You’re a dream come true.” She was, in just about every imaginable way. In short, she set the bar pretty high for the writers who will follow her at Storyknife. That doesn’t scare me. It inspires me to reach even higher. So in 2017, Frederica Cabin at Storyknife will host four women writers, one each in the months of June, July, August and September. The application period begins today, December 15th and runs through January 27th. Then, quickly, she turned and walked off, head down as if bracing for a stiff wind or readying for an overhead wave about to collide with the fishing boat on which she’d grown up. Or, maybe, simply to hide a big grin on her face. Across the Cook Inlet, Mts. Douglas, Augustine, Iliamna, and Redoubt radiated in the dwindling Fall light. I’ve been home a week now, and I still think about Dana’s words. In that moment, I understood the import of my arrival in Homer, Alaska. Sure, I’d been awarded a place to write; a place to sit and read; a place to photograph, if I chose. I’d been given a place with no expectations. No deadlines. No responsibilities. No requirements. But more than that, as the inaugural fellow of the great effort known as Storyknife Writers Retreat, I was given the opportunity to be someone else’s dream come true. We’ve all heard the words before: You’re a dream come true. I may have said them this week at the post office as I juggled a couple boxes, a stack of mail, and a dog on a leash when a stranger saw my predicament and opened the door for me. But this was different. Dana’s words had weight. They weren’t an exaggeration or a cliché. I understood in a new way my arrival at Storyknife. My very presence in Homer was the manifestation of an idea to provide women a place to write. I was thinking about Dana’s words when I returned inside Frederica cabin to get settled. I unpacked my suitcase. I set out a box of books on my desk. Then, I unloaded some groceries I’d picked up on my five-hour drive down the spine of the Kenai Peninsula. Stashing cold goods in the refrigerator, I paused to take in a photograph hanging on the wall. The setting looked familiar, but the print was aged, making me think it had been made back in film days. I would examine that photograph many times as I stood scrambling eggs over a hotplate or awaiting water to boil for tea. But it wasn’t until my last night in Frederica cabin that I asked Dana about it. And, then, it was one of those I-shoulda-had-a-V-8 moments. Because just like I’d suspected, the captured image hanging on the wall of a cabin in Homer, Alaska was taken in Hawai‘i. And not just any place in Hawai‘i. But a scenic view of Kaua‘i, the island on which I live. Of all the women from around the world who applied to be Storyknife’s inaugural fellow, the chosen one—me—would fly nearly eight hours and drive another five to find a photograph of a scene from practically her backyard. There’s much I want to say about Alaska. I witnessed the moon come into its fullness—a harvest moon, super moon, and eclipse rolled into one. I watched fog roll in off the Pacific and erase my view of four volcanoes. I took note as clouds stretched like taffy and galloped like stallions and scowled like a mama bear in the woods, all in the course of a single afternoon. I ran outside when I heard the creaky hinged call of Sandhill cranes flying overhead. I felt spit drop from the sky as if it were a bed sheet hanging on clothes line and the wind were whipping remnant water droplets out of it. I remarked over trees throwing a dance party on their top floors. I grabbed my camera to capture an image of a young moose trotting through the yard, fifty feet from my desk. I woke in the middle of the night as green curtains of light billowed across the sky. I learned that when it’s foggy atop the bluff at Storyknife the sun is shining on the Homer Spit. I understood the saying, “When the fireweed goes to cotton, summer’s soon forgotten.” And I added interesting words to my lexicon, including termination dust, spit rats, and buttwhackers. There’s much I want to say about my experience at Storyknife. The logjam of a story I’d been holding within me for more than 10 years loosened, each log more or less finding its place in alignment. At least, for now. I discovered that a writing space free of physical distractions also brought with it a head space free of mental distractions, allowing me to stay in my right brain, the creative side, for long stretches of time. It can take hours to wriggle out of the mousetrap and carry on. This became clear to me at Storyknife. Even with a few disruptions, I managed to stay in the zone long enough to produce 249 pages of a first draft of a manuscript, about three-quarters of a book. There’s something else I want to say about my experience at Storyknife. Something else unexpected came with the distraction-free writing space. It was a sense of importance. There is no greater motivator in life than when someone says, “Good job.” Being awarded the one-month residency at Storyknife was like one super-sized pat on the back. I’d never before felt so recognized for my writing. It was a warm feeling, one that hung around me for days. I also admit: There were times during my time in Frederica cabin when I fell into imposter syndrome—a feeling that my writing didn’t matter. That no one would be interested in it. But there was really nothing else for me to do, so I kept writing. Besides, Storyknife believed in me. The weight of Dana’s words propelled me forward. Now that I am home, as I ease back into my every day life and our left-brain world, I want to play my part in seeing this dream continue. One way to do that, I realize is to continue writing, to finish my book. I may have cleared out of Frederica cabin at the end of September, but I carried Storyknife home with me. There may be a photograph of Kaua‘i in a cabin in Alaska, and now there is a photograph—many of them—of Alaska on the walls of my home and in my heart here on Kaua‘i. It was harder than we thought it would be. So many fine pieces of writing to consider. Over and over, we wished that we could offer more than one residency. We made ourselves a promise to get all six cabins built as quickly as possible so that we could provide more opportunities for women to explore their own voices, write novels and poems and essays. This September, Kim Steutermann Rogers will be in residence as the first Storyknife Fellow. She moved to Hawaii with her husband, two dogs, and twelve boxes of belongings in 1999. “We’ll stay for one year,” she told her family and friends. That was 17 years ago. Now, Kim shadows scientists into rainforests, volcanic craters, and throughout the uninhabited atolls of the Northwestern Hawaiian Islands to learn more about Hawaii’s endemic—and often endangered—flora and fauna. But, most days, she sits on her bum and attempts to churn out words appropriate to the science and place and people of it all—and tells herself she should exercise more. Kim holds a Bachelor of Journalism from Missouri School of Journalism and a Master of Fine Arts in Nonfiction from Antioch University Los Angeles. She is at work on a book about Mark Twain’s Hawaii and the psychological concept of place attachment. You can read clips of her work and her blog at www.kimsrogers.com. 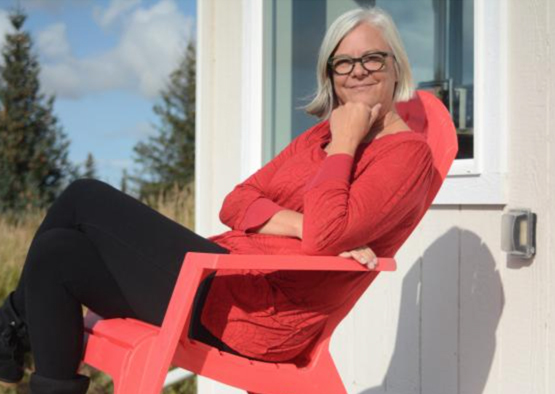 We just couldn’t be more excited to host Kim while she explores her own writing to her heart’s content this September at Storyknife Writers Retreat, just outside Homer, Alaska. Please do keep checking this blog for more information about the incredible members of our Advisory Council and how you can help Storyknife soar as a full-fledged writers’ residency for women. We’ll have exciting news unfolding all throughout the summer!